26-Seater Tempo Travellers (25+1) is perfect vehicle for outstation rentals for holiday, Events, Occasion and group outing for any purpose. We Provide 26 Seater CNG tempo Traveller for Employee movements in Delhi and NCR region and also on other cities like Banglore, Mumbai, Pune, Hyderabad , Mysuru and Diesel engine tempo traveller for outstation rental in plain area and hilly area. The 26 Seater tempo traveler is manufactured by Force Motor with highest standard of safety, comfort and power. The Engine is well playing in Both Hill area and Plain Surface. The Highest quality of Suspension and built gives you more comfort of luxury. The Space is well utilized and provide ample leg space along with luggage compartment with the vehicle and carrier on top for additional luggage. 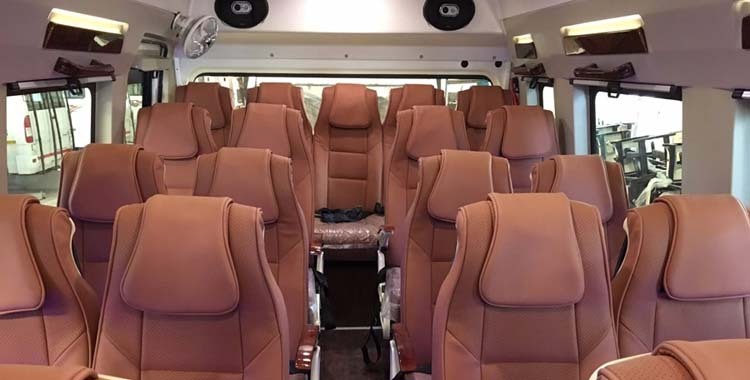 The Luxury seating comfort along with highest quality PKN designed seating layout, new and updated upholstery, Full Air conditions, With Music system, Screen on Demand and Push back seat to get relax while travelling is some of the key feature while this is so popular with business and group traveler all together. Cablo Provides 26-seater tempo traveler rentals in more than 40+ cities from where you can book your 26-seater tempo travelers to visit and explore almost 600+ cities all over India. The 26-seater tempo traveler is perfect for group tour in Hilly area and also in normal plain area. 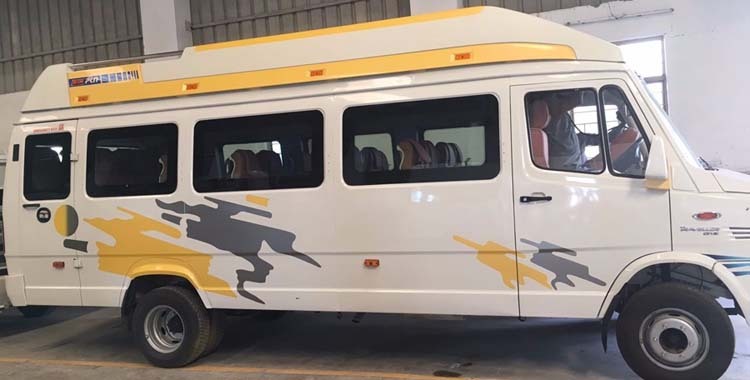 You can hire 26 Seater Tempo Travellers from cablo for outstation rentals, Daily employee movements within City limit, Shuttle services for your multi city , multi pick up and drop services for employee, Meeting Incentive and Conference for your employee within the given location, Holiday trip with family and group members. Currently Cablo is having more than 50+ vehicle in 26-seater tempo traveler segment in more than 60+ cities for your journey. By Using cablo platform you can book these vehicles for your travel in any of the cities. There is so many cheap tempo travellers rental service might be available in your market, then why you will use the expansive tempo traveller services from cablo is one of the biggest questions that suddenly keep coming in mind while checking the prices of cablo tempo traveler rental services for outstation and tempo traveler services for local ride. The simple answer is that cablo is a curated car rental and vehicle rental company with primary focus on quality and comfort of consumer then the price. We provide services to highest standard and that is the reason that we are having highest return customer for our services. While cablo is unique service providers so each trip we plan in very curated manner with almost everything gets customize as per the requirements of group and business who hire our services. Some important ingredient within our travel services and plan are must in all and common for all are as below. Fleet – we have more than 800+ tempo Travellers in our fleet of Network with 50+ 26-seater tempo travellers. All these tempo travellers are verified and audited for quality on regular frequency. We provide maximum 7 years older vehicle only and any vehicle that is more than 7 years older is not running on our network at all. So, this will ensure that we keep introducing new vehicle in our fleet and discarding older and any vehicle that not look like suitable for us in several of our parameters. This provide us highest comfort for the consumer and assure the primary quality must be matched with no question to anyone. Drivers – While we understand that a group travel always come with several kind of issue due to disputes between people, culture crash and many other reasons, we try to mitigate those or minimize at least to maximum extend by providing a full trained driver with complete security check and other required verification. Those Drivers are well trained in handling customer in dignified manner as well. Apart from these we also trained our drivers and if required we provide multiple driver on single vehicle or special drivers with local knowledge and language easiness. The purpose of the regional driver services is to give you comfortable guide on location along with minimum language barrier while communicating with drivers. These are some of the most important aspect of driver management that we take care for our outstation trip, Business trip and employee movements so that you feel always feel comfortable and at home while experience the world with us. Limited Garage Km – We fix the Garage Kilometer to Maximum 30 Per Trip for all Tempo Traveller, so even any vehicle come from 50Km away, you need to pay only for 30 Extra KM each side in Maximum. GSP Integrated – our 26-Seter tempo travellers are pre-fitted with GPS system for easy navigation and highest safety and security of our guest and driver everyone. Apart from GPS we also take care and keep adding new security feature in vehicle on regular basis. 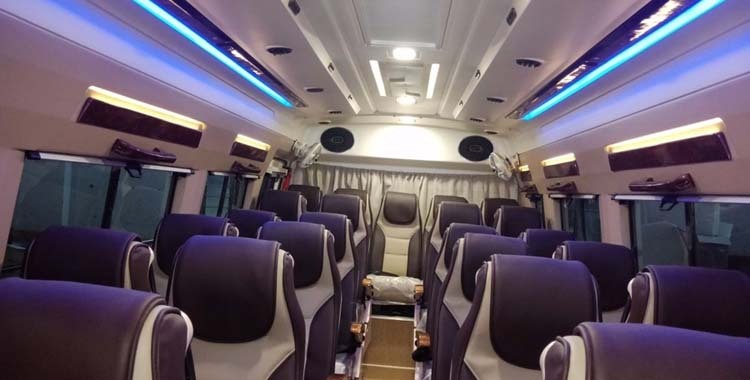 Guide on Request – Cablo 26-seater tempo traveler for outstation rental is not just a vehicle rental scheme. This is full holiday travel planning as well, so in the case you need trained and government verified Local guide for your city tour with translator, we are able to provide those services as well. Hence this way didn’t need to go to any other place to look for anything within your entire tour plan and trip managements. We enroll and appoint travel guide / Translator with pre-verification and re-validate the certification from the appropriate agency for high safety and good quality assured for our consumer. Night Driving – We Understand that when you are planning a trip for limited time, more often you would like to drive on night as well, here we Help you with Free Night Drive Charge and you need to Pay Only Driver DA on Per Day basis. Upfront Costing – We dont believe in hidden cost, so we provide you prices where nothing hidden at all, all price you know up front and there is no surprise element for your budgeting at all. Round the Clock Services – Our help and support team provide you full support for within entire journey and at any time you can call our customer care and operation team to discuss your Issue and query, we will happy to help you. Book on Website – You can Make your booking on website by register and book with our fastest booking process that will take maximum 3-5 minute to complete the entire process. Note – The Price showing in online booking exclude, Parking, State tax and Toll tax and that need to be paid extra at actual basis only.